What makes a plain workshop to bet on everything to challenge the established myths? I mean reputation and financial resource to integrate downward into Airsoft gun manufacturing? Because their technologies works! Poseidon thinks shooting far, straight, and precision does not mean collateral damage on friendship if low kinetic can do the same thing. So Poseidon is not just “fire and forget” like other upgrade parts workshop, it directly implements the said technologies bundled with own-named guns in the market to prove the efficacy. To sum up：Poseidon/BW’s agenda is carrying the positive reciprocal cycle between upgrade kits and finishing guns. We will see! Positioned as a flag ship of Poseidon, the custom pistol was built with every upgrade parts and tens of labor hours to forge the exclusive uniqueness for G_lock enthusiastic who regards the high standard as a non-compromise. It is also a paradigm worthy of technicians in every Airsoft shop to imitate and learn the craftsmanship. P18EVO has a higher mission rather than its sales record alone—To lead the way for Poseidon’s patented upgrade parts in the aftermarket. B&W is the sub-brand of Poseidon, it was aimed for the entry-level consumers, but the prominent characteristic has not been removed because of budget reason. BW17TB is the third generation of its classic BW17【GP917】, it not only owns an Air-cushion® inner barrel and two-stage hop up bucking to deliver the astonishing trajectory with low muzzle velocity, but also carries various out-looking appealing to different tastes. W model means symbolically Warlord/Warrior line on slide, while H model means Heat-sink ventilation holes. TB has often been taken as “Threaded outer Barrel” though it is not an exclusive design, in fact, BW17 series(【GP917】and【PBW-S17B】can also be mounted with threaded adapter and lids,【BW-01-01/-02/-03】. Another explanation for TB is “Turbo” , which extends the shot range if people mount a 113mm or longer inner barrel inside the silencer kits. To sum up, BW17TB has been upgraded from the interior to the exterior, and is the first one G_lock Airsoft pistol built with silencer adapter in market. Quite a temptation! As an representative work in the entry level market, Poseidon has injected the most essential performance into this classic gas pistol- shot range- by patented trajectory kits, Air-cushion® barrel and two-stage hop up rubber. The sealed silver round sticker is the quality assurance from Poseidon. 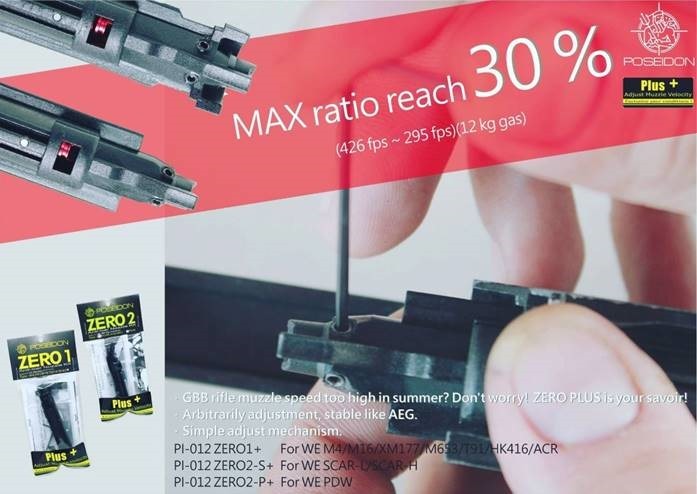 PBW-S17B was meat to open the eyes of gas pistol owners with the most prominent efficacy, say 55m flying distance (click to access)using 0.28g BBs, to pave the way for other upgrade kits. This plain vanilla G_17 owns aluminum slide and polymer frame, its blank slide and frame not only bring the cost advantage, but also a good platform for gunsmiths or workshops to develop their G_17 variants with custom value-added service. It owns the most prominent trajectory performance because of the length of 113mm inner barrel. There are two finishing- satin black and shining silver. Thanks to the aluminum structure, its weight is quite balanced in palm and easy to draw from holster. The shallow groove in front of the muzzle proclaims the slugger a long shot range on battle field because of Air-cushion® effect. 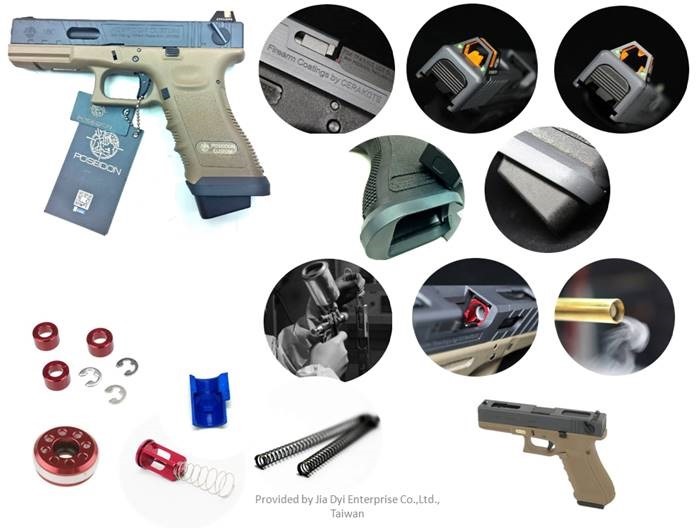 Jia Dyi works as the general agent, we supply spare parts so that none of your investment in B&W pistol will be wasted. Besides, BW/Poseidon pistols both can perfectly fit with WE gas magazines. Balancing your sales portfolio with quality choice is always the best rule of thumb when timely procurement is not so easy to be accessed. Poseidon uses three screws on the reinforced nozzle to scale down/scale up the output of WE GBBRs to meet different rules on joules in importing regions. Moreover, the stable output and anti-frozen property of the said kit have given GBBR gunners a unprecedented shooting pleasure under cold weather. The motherland of Airsoft, Japan, has successfully launched it as the pioneer for global market, and got positive feedback. 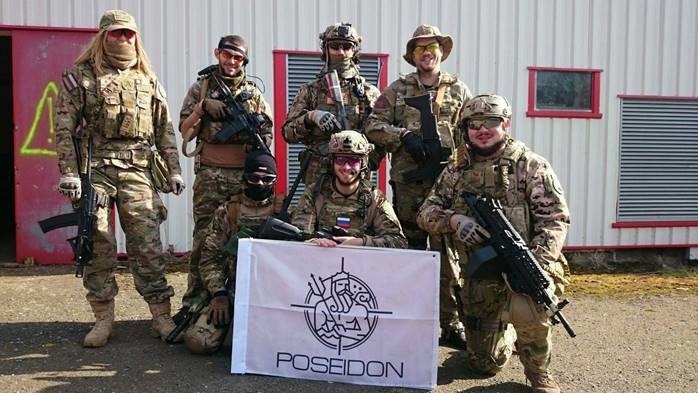 Despite of GBBR ban in war game due to high velocity, Poseidon demonstrates again the role of peace-maker through “play it safe” rather than fiercely, and GBBR can be a choice for war gamers. For users who don’t mind the adjustable function, simply choose the【BR-POS-PI012 ZERO1】,【BR-POS-PI012 ZERO2-S】and【BR-POS-PI012 ZERO2-P】to enjoy the shooting in cold days. 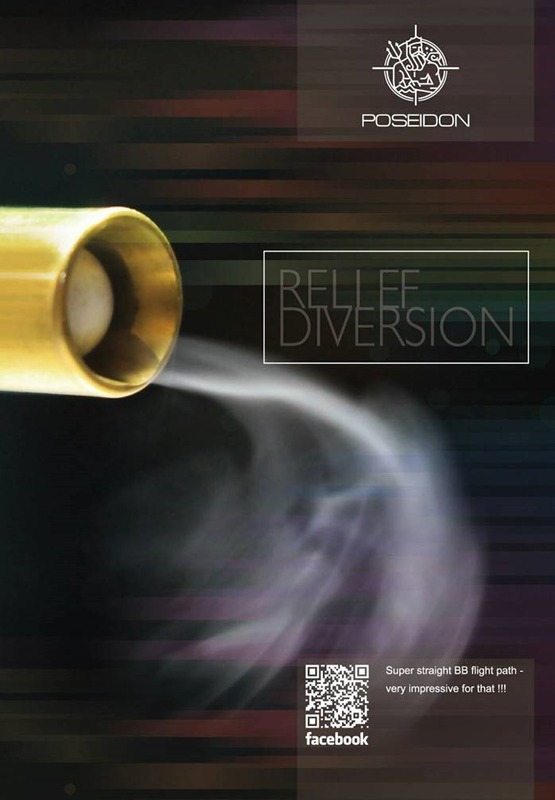 It’s a small and most widely used application to deal with nozzle choking after rapid sequential shooting with gas guns. Tapped spring and aluminum blades structure will not stick to inner wall of nozzle, instead, cutting the ice, and so facilitating the moving of gas divert valve. Red【PI001】 for WE/Marui/B&W/KJ; Golden【PI004】for Marui, and Purple【PI005】for VFC GBBRs/PX4. The stock part from gas gun manufacturers is a rubber bowl named as piston lid in explosion diagram, they are easily frozen and lose resilience during rapid shooting, thus causing gas leaking and quick consumption in gas magazine. ICE BREAKER® with three diameters in aluminum construction will sweep the embarrassing issue with the help of double C type Teflon® O-ring as the durable, self-lubricant interface. Red 【PI006】for G_lock and old system of M1911 in WE; Blue【PI007】is for most of WE gas pistols and Marui FN57; and Golden【PI008】is for Marui and B&W, as for the other brands, they often can find solution after measuring the right size to fit within three ice breakers. We have talked about how to tune gas magazine to apt to low temperature. Never squander the precious propelled gas of magazine; it is critical if you can shoot more pellets than your opponents on battlefield when meeting in alley. By restraining the output of gas, you earn more effective shots, that’s so simple. Original parts of gas gun manufacturers use rough mold to produce metal chamber shell, it’s nothing about precision and durability. 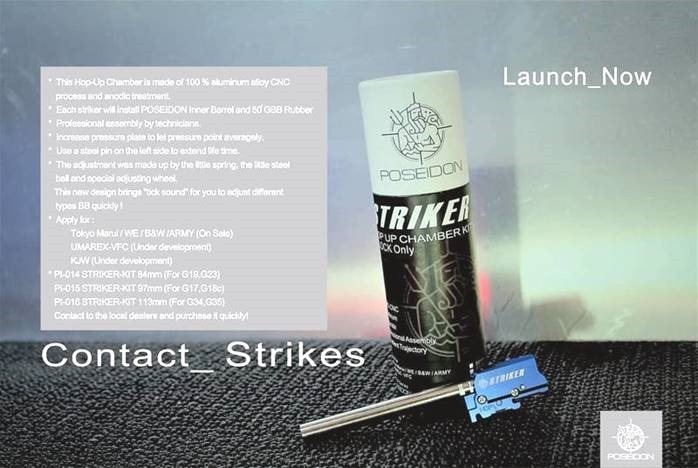 Poseidon use CNC cutting to build the aluminum Striker® chamber kits which was mounted with a steel pin at the fragile part that resists the blow-back thrust. Thanks to the precision cutting, the rotation of hop up adjust wheel becomes smoothly and easily operated, and so the air-seal and hop up effects almost flawlessly be presented along with its Air-cushion® and two-stage hop up bucking. 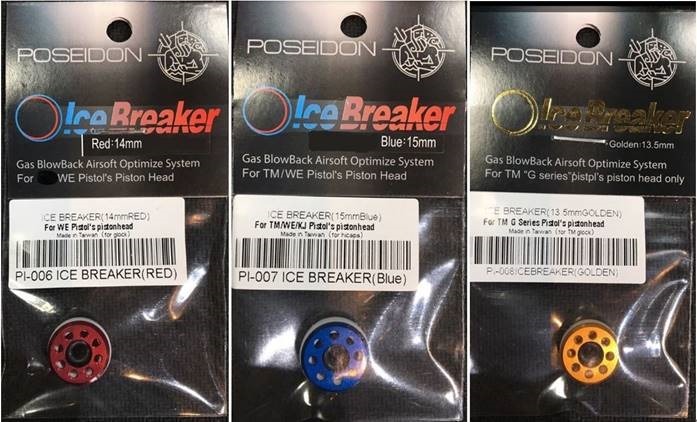 Poseidon P18EVO was built with red Striker® chamber kits, while the blue Striker® was for G_lock series of Marui/WE/B&W/KJ/HFC those who were compatible with T.M. People can easily understand the principle of “Air-cushion” by simply checking with the horizontal split from an old stock inner barrel (if they can). The BBs did not move in the center of diameter of cross cut, but move along the upper ridge of tube, so there is a white scratch at the upper inner part. Air-cushion acknowledges the fact and directs the jet stream to hold the pellet from the bottom till the end of the muzzle. Basically it generates a super backspin force along the whole tube from the bottom and reduces the interference confronting at the upper rear of the ball. Simply imagine: how hard it will be to align the two grooves at both ends of tube then you will know how low the good yield of a qualified Air-cushion® inner barrel can be! Hop up bucking as the first upgrade parts people want to escalate their Airsoft guns, there hides lots of technology in dimension less than 1cm square. 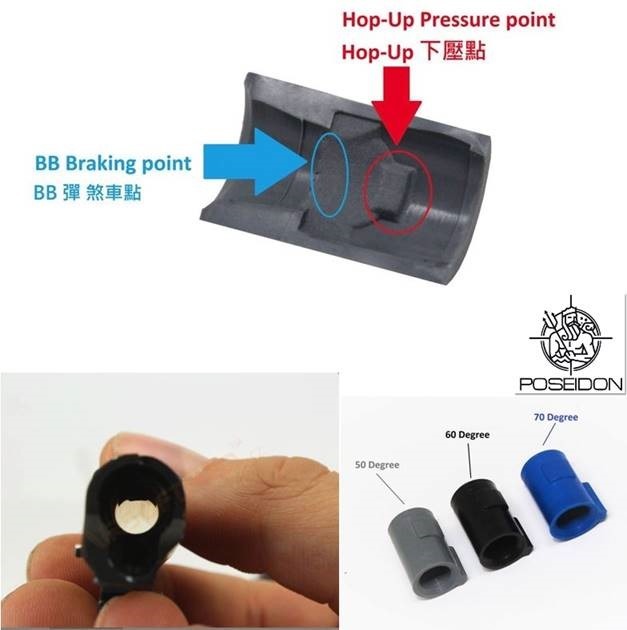 Poseidon use two-stage concept to get a better positioning whenever the BB was loading into the chamber- braking with low ridge and firing under pressing block to generate backspin force. Poseidon/BW is seeking for regional dealers in countries worldwide, Jia Dyi works as the global general dealer of Poseidon/BW, we are desirous to meet you at sales@jiadyi.com, for the said above Airsoft merchandise, please contact the local dealer first(see our allies).